Silvio, switschi's Sign Atelier Leipzig Germany. The workshop with Jeff was very helpful, his passion for the craft is very evident. I have learnt to get a feel for brush and paint which is exactly what i was wanting, especially with script lettering with a lot of momentum that is very important. thanks Jeff! I had the pleasure of taking a day workshop with Jeff. His enthusiasm and generous encouragement made for a wonderful day. I came away with valuable basic knowledge as well as the confidence to pursue this fabulous art form which he delivers with professionalism, talent and experience. I was lucky enough to to attend Jeff's workshop in February 2018. I didn't regret a single moment, Jeff is a passionate signpainter and teacher. The love he feels for his trade flows freely during his demonstrations and is extremely contagious. As a mentor he is encouraging and positive, he also knows how to give proper constructive criticism where improvement is needed. His help and his smile extend beyond the workshops and Jeff will continue to actively contribute to your progress. Plus he's hell of a funny. You are not only an incredible craftsman but also a great teacher! With your humor, light spirit and enthusiasm you give your „students“ such a calm, laid back but yet exciting atmosphere to learn, no matter what their level is. Even a total newbie feels like they are in the right place and welcome. And only is that given, can someone really learn to their given potential. thank you so much for that, Jeff. Cant wait for your return. Jeff’s 2 day workshop was fantastic, I attended the course in Copenhagen in February 2018. Jeff is a natural teacher and I learnt so much from his demonstrations, his handouts and his one-to-one feedback. He makes time for every student throughout the course and is really positive and encouraging with his feedback. His joy in painting and love for the craft is really obvious so the atmosphere over the course is just great. After the couple of the days I could really see improvements in my brush lettering and in the rest of the students work. So if you want to advance your brush lettering or if you’re just starting off then this is the ideal course for you! I’ve had the pleasure of attending one of Jeff’s workshops on Casual Script in Copenhagen. As a complete beginner (first time ever holding a mahl stick!) I was quite intimidated by the task awaiting and yet Jeff made me feel comfortable right away. His clear instructions and demos, true professional and expert eye and his humorous personality made the course not only an enjoyable experience but also inspired me to further explore the wonderful art of sign painting. Jeff is a talented signpainter and encouraging teacher. His passion for the craft emanates around the studio, inspiring you to practice & improve. Watching his brush skills, and listening to his tips & techniques first-hand, are invaluable. 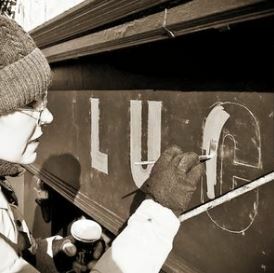 If you're thinking of doing a signpainting workshop, Jeff is the guy to learn from -- he is generous passing on his years of experience, he takes the time to watch your technique, and provides constructive feedback with positivity and humour. As a left-hander who'd never used a mahlstick or enamel paint before, I was apprehensive at trying signpainting, but after only a few lessons, I felt confident mixing my own paint, using the correct stance, loading the brush and utilising the mahlstick. Thank you Jeff for your patience and guidance! Attended Jeff 's two day workshop in Athens Greece. From the get-go he made us feel at ease with his brilliant attitude and teaching style. He was always there to help and his massive lettering experience meant that a little tip from him made a load of difference to my results. I learnt more in 2 days than I managed in the last two years of lettering attempts. I thoroughly recommend attending one of his courses, not only to learn from the best, but also because of the attitude and friendliness. I'll be back on the next one!!!! When I first saw Jeff´s work especially his scripts I was impressed. Because Jeff has his very own style which fascinates me, the most interesting part for me in hand lettering are the different styles and flows of a letter or word. So the technical part of writing are the most interesting thing for me. In two separate workshops on four days I´ve learnt and understood his process very well. The way he showed how he gets a funky script is the most interesting part … 1. A fast sketch with a pencil (reminds me to tagging/Graffiti) 2. To lay the formed brush strokes on the sketch. 3. The usage of a mahl stick which is quiet important. I´ve learnt that the consistancy of the right angle, the paint and rhythm for each letter is the key to get his styles – but in the end it´s a lot of practice. 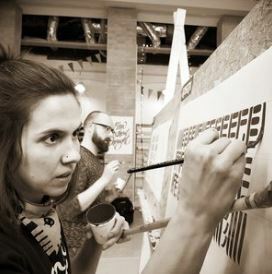 After a year of researching signwriting workshops Marshall Artz stood out as the one that is right for me. I have a solid understanding of handlettering but wanted to step up my game and develop my own style. From the very beginning of booking the class, Jeff had a way of making me feel inspired and welcomed to join him for the day. Script was the goal and it is where the day finished but Jeff had me straight into casual lettering to loosen up and develop a good lettering base. The casual lettering practice was an eye opener to signwriting letters with “character and soul”, for me to hear a teacher talk about soul of a letter got me excited. Jeff’s instruction was uncomplicated, he gave up so many tips and skills in developing good legible casual and script lettering that i will take away for a lifetime! Some pretty funny banter was shared all day but most importantly the encouragement and enthusiasm is what struck me most, and those tips on getting the script to look just right was invaluable. I feel my script improved out of sight in such a short time, just a few quirks here and there, now i can see how Jeff’s script is constructed which is something i didn’t expect. The day finished and i took away with me a life time of inspiration, layout sheets, trade secrets and great memories... Thank you Jeff, you taught an old dog a lot of new tricks that will further develop me as a signwriter, looking forward to our next tune up session in the not too distant future.